Taylors have re-vamped their Origins range, or perhaps simply replaced it with a very similar ‘Single Origin’ one. Although none of the old origins that I can recall remain, the coffees are all from a single country – in contrast to their core range which are blended from beans across multiple countries and regions. 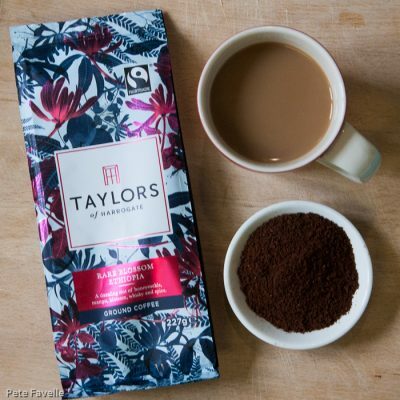 Rare Blossom Ethiopia is from the country that is often described as the birthplace of coffee, although the earliest accounts of actually drinking the stuff are from (almost) neighbouring Yemen. This particular coffee comes from the Oromia region in the west of the country. The grounds have a wonderfully fruity aroma; pomelo citrus with a hint of something richer and more tropical – perhaps mango – gives an almost hoppy feel. Beneath that is hints of freshly cut wood and a touch of honey. Brewed, the fruit notes are richer, but more subtle and the wood becomes older, like old whisky barrels. The honey notes remain in the background, too. In the mouth, it’s delicious; fresh and fruity, with a nice citrus acidity which keeps it light and gives a nice dry finish. Definitely a daytime coffee – it lacks the depth of the likes of After Dark – but it’s a wonderful example. This could easily become a fixture in my coffee cupboard – 4.5 stars.